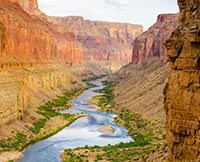 Why choose Western River Expeditions for a Grand Canyon Rafting Tour? I'm often asked this question - Why should I choose Western River Expeditions over other outfitters in the Grand Canyon to provide my Colorado River Rafting vacation? Here's just a few of the great reasons. 1 - Western has the best guides & leaders. 2 - Western has the newest equipment and rafts and is the only one with the j-rig. 3 - Western's trips are all-inclusive. 4 - Western provides deluxe camping equipment. 5 - Western has delicious dining - the best meals on the river! 6 - Western is family friendly and their trips are also great for solo travelers. 7 - Western's guides & leaders care about your river safety. 8 - Western cares for the environment - their green friendly. Do you really need more reasons than that? If so, call me at 1-800-453-7450.